John Biggs, author for the popular gadget and tech website Crunchgear has recently posted his review of the KSO Trek. 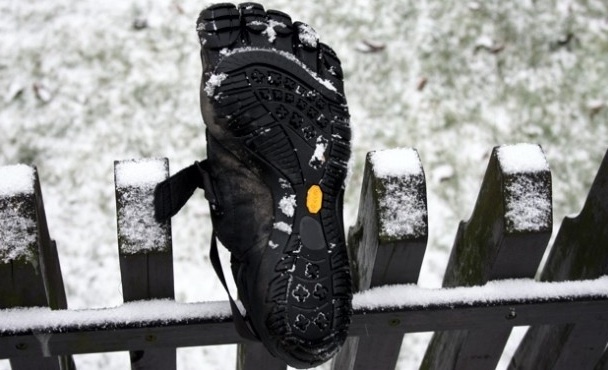 His verdict: just as comfortable as the VFF Classics, but with added ankle and upper protection…enough even to let him wear his KSO Trek shoes in the snow for a run. John said the reason he started running in Vibram FiveFingers shoes (he started with the Classic) was that he had problem with plantar fasciitis and shin splints while running in traditional running shoes. After switching to the VFF classics he found that those problems got better and he feels much better while running. After his positive experience with the Classics VFF’s he decided to give the new Vibram FiveFingers KSO Trek a try, since the one thing that was missing from the Classic was upper protection from the elements (the Classic is an open shoe on top similar to a slipper) which didn’t allow him to run in cold or snowy leather. The KSO Trek, on the other hand features an ankle covering and upper that is made from 100% kangaroo leather. Now whether kangaroo leather is good or not I have no clue, but it sounds pretty good. This extra leather and protection is what separates the KSO Trek from Vibram’s regular KSO shoe. After he started running in the KSO Trek shoes that it definitely feels similar to the VFF Classics, but offers more protection from snow and does a good job of “keeping stuff out.” Whether they have helped him further reduce injuries he says still remains to be seen.